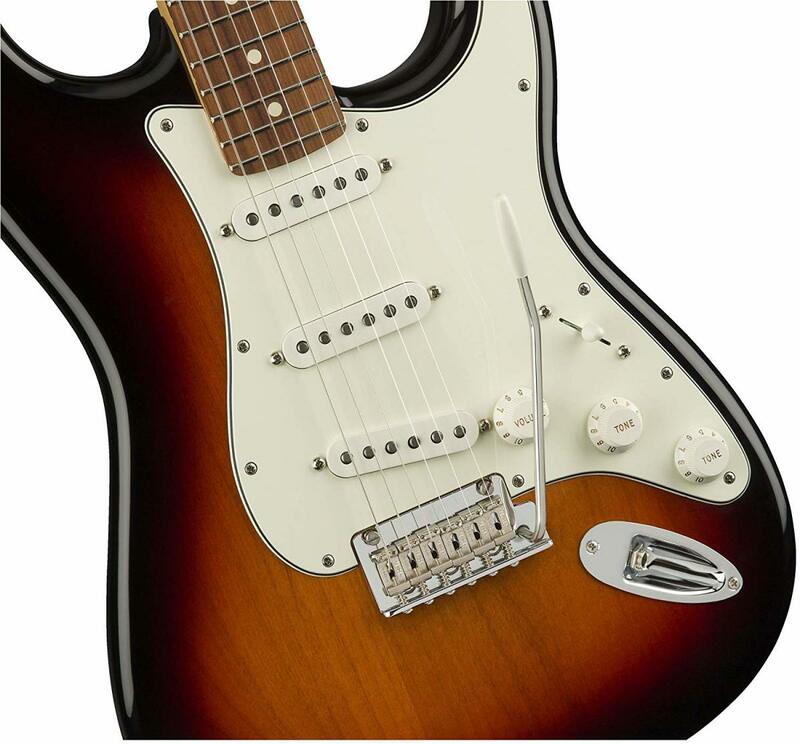 Fender's Standard HSS Stratocaster with a Floyd Rose is a great choice for metal. The Fender Stratocaster is one of the most popular guitars in the world, and it is easy to see why. It’s proven itself in just about any genre you can name, from blues to jazz to classic rock and, yes, even heavy metal. But the reputation of this legendary guitar has withered a bit in recent years when it comes to heavy music. In modern metal, many players feel that resonant tonewoods like basswood and mahogany better capture that de-tuned, high-gain tone they are looking for. I have to agree, for the most part. But I also remember back when bands like Iron Maiden and Judas Priest relied on the Strat for their epic metal sounds. If you are looking to tune down to drop-C and bash out some modern death metal it might not be your best bet, but I do think this guitar still has a place in heavy music. For classic metal, thrash and hard rock it has a unique sound that’s tough to find elsewhere. In this article I’ll point the way to my top choices when it comes to Stratocasters for heavy metal. I’ll also mention a few non-Fender alternatives you might consider, just in case you are looking for a Strat-style guitar that marches to a slightly different drummer. Body: Alder is the traditional tonewood you’ll find in most Stratocasters, but there are a few other possibilities. Ash and basswood are probably most common, but remember that the further you stray from that crisp, mid-rangy sound of alder the less Strat-like the guitar will sound. Neck and Fingerboard: We’re looking for guitars with maple necks here. You’ll find some options with rosewood fingerboards, and some with one-piece necks and maple fingerboards. Both are keeping with the traditional tonal profile. Pickups: Three single-coil pickups is the classic configuration. That’s great for blues and rock, but for metal we need something a little meaner. We want a fat, hot humbucker at the bridge position. Scale Length: It should go without saying, but to make my list a guitar has to measure the classic Fender scale length: 25.5". This is part of what gives this guitar its sound and feel. Bridge: There was a time when nothing less than a Floyd Rose tremolo would do it for me when it came to guitars for metal. I’ve lightened up a bit, and these days I’m of the opinion that it’s up to the player. Whether you choose a locking tremolo system, a hard-tail bridge or a standard synchronized tremolo, there are pros and cons to each type of bridge. So let’s get to it. If you play metal and you want a Strat, here are my top recommendations. Simply choosing a Fender Stratocaster with a humbucker and two single coils (HSS) is a pretty easy way to land a great guitar for metal. You can tick all the boxes mentioned above, including the humbucker you need in the bridge. You know Fender quality is top-notch, and you know you’ll be getting the sounds you want from an amazing instrument. Done! Not so fast. There are about a bazillion versions of the HSS Stratocaster offered by Fender, so how do you choose? The deciding factor will likely be how much you are willing or able to spend. So, here’s a brief rundown of some of your options, from priciest to least expensive. Fender American Standard Stratocaster HSS: This is the flagship of the Fender lineup, the headwaters from where everything else flows. For 2016 it comes equipped with the powerful Shawbucker humbucker at the bridge. Fender American Special Stratocaster HSS: This is a great American-made guitar that comes in at an affordable price. It features the Atomic Humbucker, a pair of Texas Special singles and Fender’s patented Greasebucket tone circuit. Fender Standard Stratocaster HSS: Casually known as the MIM or Made-in-Mexico Stratocaster because it is built in Fender’s Mexico facility. This is one of the best intermediate-level guitars out there, and it comes in around half the cost of its American namesake. Squier Vintage Modified Stratocaster HSS: Squier is Fender’s budget brand, but even though they are affordable they still have to live up to the Fender name. The Vintage Modified Series offers some of the best Stratocasters for the money. Squier Affinity Stratocaster HSS: If you are a beginner, this is where you start. Affinity-series Squiers offer newbies a chance to learn on a real (but very affordable) Strat. That’s just the tip of the iceberg. A glance through the Fender catalog reveals a bunch more options with a humbucker at the bridge position. Here's one more Fender option I didn't list above. I’ve been playing a Standard (MIM) HSS for years, and I couldn’t be happier with it. 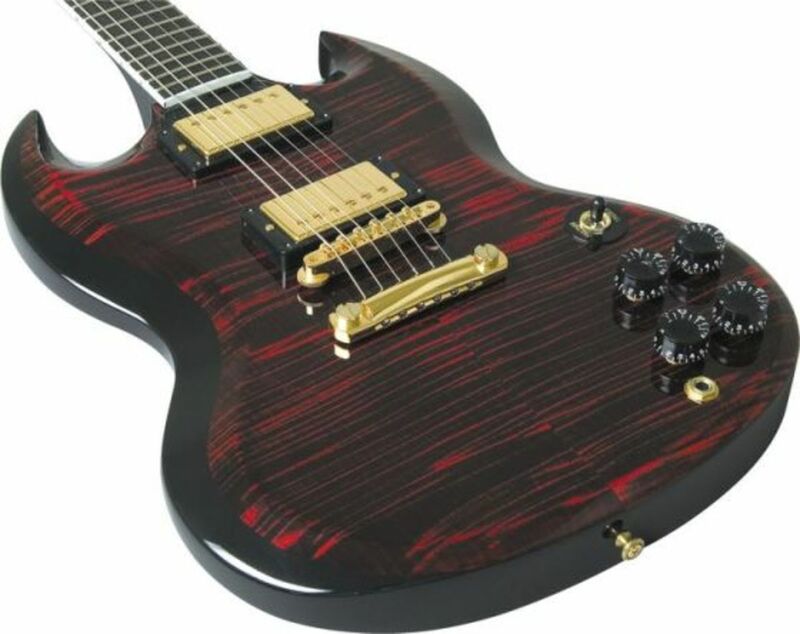 It’s a quality guitar for the money, and for classic metal it has a great sound. But my version has a vintage-style tremolo system. Had I to do over again, I may have gone with the Floyd Rose version. A Floyd provides solid tuning stability you just can't get from standard synchronized tremolos. Obviously this means you can go bonkers with the whammy bar and expect your guitar to come back to pitch. Vintage tremolos are useful for basic vibrato effects, and don’t do well with heavy usage. But a Floyd Rose double-locking system will also help you stay in tune with aggressive play and string bending. The Standard HSS Strat with a Floyd may be your best bet when it comes to affordable Stratocasters for metal. It has the alder body and bolt-on maple neck we’re looking for, along with all of the other hallmarks. Plus, since it comes from Fender, you know you’re getting quality you can take to the bank. My one hang-up over this guitar is that it is only available with a rosewood fingerboard. This is a personal decision, but I’ve always preferred the one-piece maple neck and fingerboard. To me it feels slicker and has a little more bite. If you’re cool with the rosewood obviously this is no issue. So, maybe you’d rather go with another brand besides Fender. There are a couple of reasons you may do this. The first could be that you’re simply a poor decision maker. For those who don’t recognize the awesomeness of Fender perhaps its best to quit guitar for a while and think about the direction your life is taking. But another reason you may choose a different brand is because of the traditional nature of Fender instruments. With Fender you’ll get a guitar with a classic pedigree that doesn’t stray far from its legendary roots. That’s pretty cool, but it does have its limitations. Some other companies have taken the Strat design and shaped it into some amazing metal machines. These instruments have become known as superstrats, and below I’ll talk about a few of my favorites. My #1 Strat-style guitar for metal is the Charvel So Cal Pro Mod. This is an instrument with a heritage dating back to the golden era of shred and metal in the ‘80s. Back then, it seemed like every shredder and metal guy on the planet was carrying a custom-made Charvel. Today, Charvel produces a few expensive American-made guitars and signature models, but their Pro Mod Series is an affordable option that recalls all the great stuff that put them on the map. With an alder body, maple neck and fingerboard and 22 jumbo frets the So Cal has the chassis we want, along with a Floyd Rose tremolo and a set of hot Seymour Duncan Distortion pickups. This is a hot-rodded metal machine, built for speed and precision. Also consider the Charvel Pro Mod San Dimas, which shares a similar heritage. It has a Duncan JB at the bridge and ’59 in the neck position for a more classic sound. Both guitars feature a 3-way switch and a push-pull coil split for a total of 6 available sounds. The So Cal is my top choice when it comes to Strat-style guitars for metal. It comes in some wild colors for 2016. I like the Snow White, but I have to admit those neon colors are pretty cool too. I’ve written about this guitar a few times, and each time I say the same thing: I love Iron Maiden, and I love Adrian Smith, but I don’t typically love signature model guitars. This is one exception. It’s also one of the most affordable options in this review. 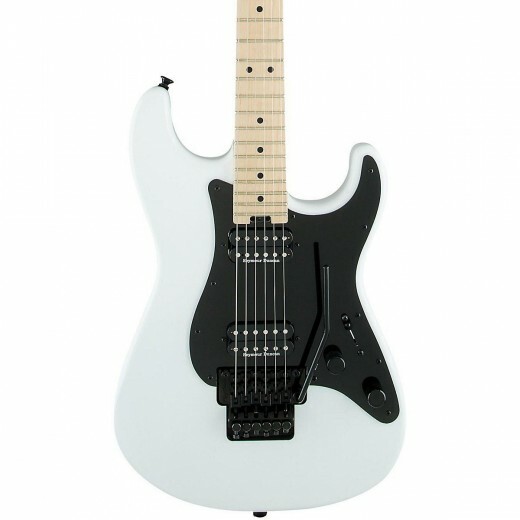 The SDX is based on Smith’s signature model Jackson guitar. It features most of the specs we’re looking for, with a few key differences. For one, the body is basswood, not alder. Basswood is a darker, woodier tonewood that will give you a beefier sound. The SDX has a hot Jackson humbucker and a pair of single coils, controlled via one volume and one tone control and a 5-way switch. But one of the biggest differences is the Jackson name on the headstock. 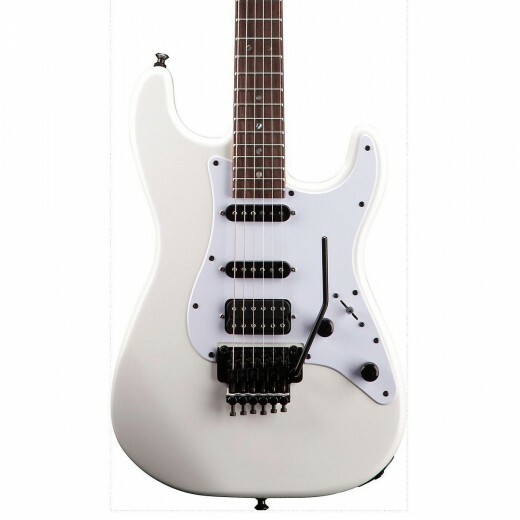 This guitar is a departure from more typical Jackson superstrats such as the Soloist and Dinky. In fact, it has a Fender-style headstock instead of the traditional Jackson pointy headstock. 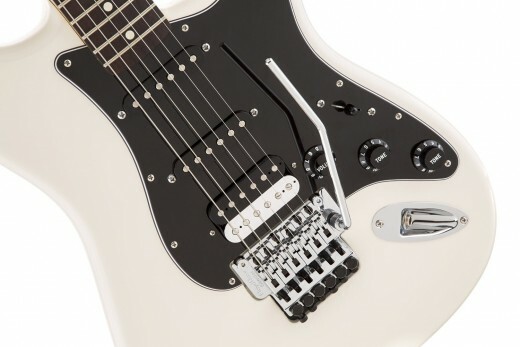 Like the Charvel guitars above, the SDX looks just like a Stratocaster. And isn’t that headstock design supposed to be trademarked? 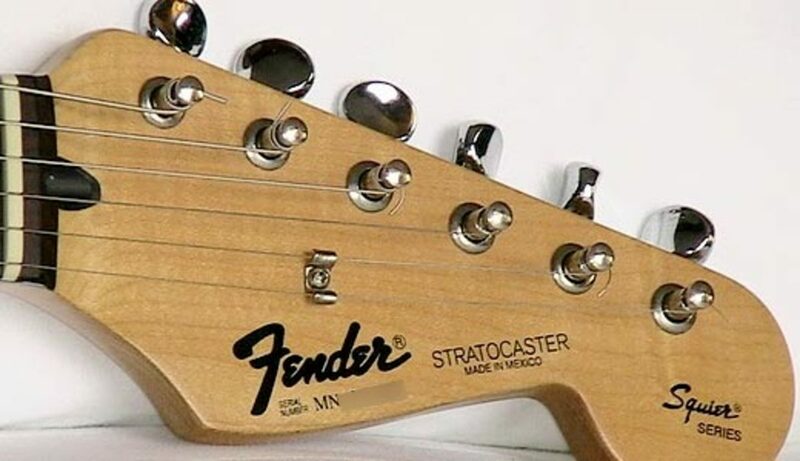 Why does Fender stand for this? Well, here’s a little secret: Both Jackson and Charvel are subsidiaries of FMIC. FMIC stands for Fender Musical Instruments Corporation. I’ll let that sink in for a moment. That’s right! The best Stratocasters for metal are all in the family! But remember that both Jackson and Charvel have a legacy of their own, dating back long before their association with Fender. Here are a few more guitars I’d say are worth checking out. EVH Striped Series: This is another brand under the Fender umbrella, but that’s not the only heritage the EVH Striped Series shares with the Stratocaster. Remember, Eddie Van Halen was one of the original tinkerers. His famous Frankenstein guitar was built from aftermarket Strat parts and Fender hardware, along with a Gibson PAF humbucker. It was, in many ways, the original superstrat. The EVH Striped Series seeks to replicate those awesome guitars from Eddie’s history, with a few alterations for the sake of modern performance. They are also fairly affordable, at least compared to other replicas of past and present. Kramer 84 Baretta: If you’re looking for a hot, single-pickup guitar not from the EVH brand, this one is a good bet. Kramer is not under FMIC (they are under Gibson) but for a brief time in the early ‘80s Van Halen played a Kramer and endorsed the brand. Kramer has seen a roller-coaster ride of ups and downs since then, but today they offer a few cool options, particularly for those who remember the glory days of metal. The 84 Baretta features a single Seymour Duncan JB pickup, a Floyd Rose tremolo and a maple fingerboard. Schecter California Traditional Custom: Schecter guitars are known for metal, but in the Traditional series we see some very Strat-like designs. I talked about this guitar in my post about the top Stratocaster alternatives, and I think it offers a great option for players looking for something other than a Fender. The Custom model has a Schecter Diamond Plus humbucker at the bridge postion. I’d love to see Schecter release a version of this guitar with a Floyd Rose. Carvin/Kiesel Bolt Classic: Carvin guitars are now under the Kiesel brand name. The great thing about Kiesel is that you can choose whatever woods, pickups and hardware you want to assemble your own custom guitar. If metal is on your mind, you can go with a Floyd or a hard-tail bridge, and choose from their catalog of active and passive humbuckers. In this article you’ve been presented with some of the top options when it comes to Stratocasters and Strat-style guitars for metal. The choice is yours, and you might have some thinking to do at this point. So, which would I choose? If I were purely focused on metal, I’d go with the Charvel Pro Mod So Cal. It has everything I need, including the Floyd, hot pickups and the one-piece maple neck I love. However, if I were looking for the most authentic experience possible, and if money wasn’t an issue, there is no substitute for the Fender American Strat HSS. It is one of the best guitars in the world for a reason. Plus, it has the flexibility to handle other forms of music as well, such as blues. As it is, I have been very happy with my MIM HSS Strat for many years, and I highly recommend that option for those on a budget. And, it’s cool that it also comes in a version with a Floyd. Good luck choosing the best Strat for metal! Are Squier Bullet Stratocasters good for metal and hard rock? Squier Bullet Stratocasters are designed to be affordable, entry-level instruments and they are very good at being exactly that. In my opinion, if you can afford to move up to the Squier Affinity Stratocaster, you’ll get a better all-around guitar, but there is absolutely nothing wrong with playing a Bullet Strat when you are first starting out. If you intend to play hard rock and heavy metal you’d be wise to get a Bullet Stratocaster with an HSS pickup configuration. This means it has one humbucker and two single-coil pickups. The basic Strat design features three single-coil pickups (SSS), and that’s fine for rock, blues, and country. However, a humbucker will sound better for metal and hard rock. Most Bullet Stratocasters also have “hardtail” bridges. This is different from the tremolo bridge found on traditional Stratocasters (even Squiers). For beginners, it means slightly better tuning stability and less aggravation. Again, I usually recommend Squier Affinity Stratocasters for beginners, and if you are into metal, there is an HSS model. However, if you are really counting your pennies, there is nothing wrong with a Bullet Stratocaster. Many new guitarists get their start every year with a Bullet Strat, and it has remained a popular guitar for a good reason. Remember, this is just my opinion. Always do your own research before choosing gear!